You may have lived anywhere in the country, but you’ll realise only in Mumbai that monsoon footwear is a legit thing. And if that immediately makes you cringe because you’re thinking tacky, rubber-y and dull footwear, you are in for a surprise. Hill Road in Bandra is brimming with a range of anti-slip footwear in trendy colours and swanky designs, so many that it can baffle you to make your choice. From flip-flops to gumboots, to ballerina and peep-toes, they’ve got it all. Head to the road perpendicular to Bandra’s Marks & Spencer and every stall on the street side will have brightly coloured shoes hanging from strings. We found a varied range of designs that, in our heads, will suit every type of personality. Two little stalls in the lane opposite Giani sweets have shoes with holed upper and fluorescent laces in colours like orange and green for INR 450. And then they have colourful slippers which mix and match bold colours and are priced at INR 290. For the sporty kinds, another shop 10 paces ahead is selling yellow and black shoes with laces (they look like football shoes from a distance) starting at INR 350. The same shop had another design – loafer like model with a thick sole and a soft upper in pink and black with proper ventilation for your feet to breath for INR 400. Apart from all of these, mostly every stall has flip-flops in quirky prints starting at INR 150. Looking at these stalls made us believe that we will find more designs if we walked ahead. And we were right! Another 100 metres ahead, yet another stall is selling ballerinas in blue, beige, and black with a sophisticated bow on it for just INR 350. Go a little further and you will also find translucent shoes with really (really!) bright fluorescent laces that immediately makes it pop for INR 450. 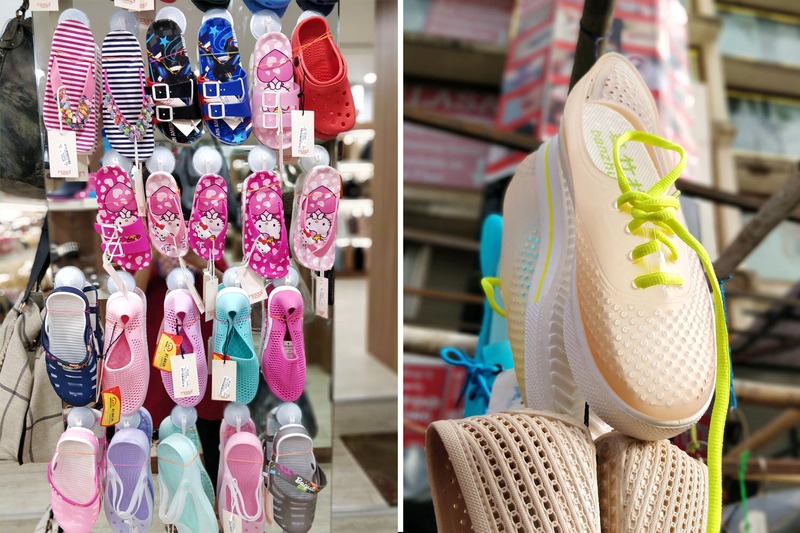 Apart from the street stalls, there are also stores like the one called Funky Collection which had everything – crocs (plain ones for INR 350 and printed ones for INR 450), and gumboots in solid colours for adults starting at INR 895. And they even had cutesy gumboots for kids with cartoon prints for INR 495, besides other range similar to those selling outside. And then of course there’s La-Judi opposite Reliance Trends that is a trusted source for gumboots for INR 650. Save your fancy shoe wardrobe and get to Hill Road in Bandra for a variety of anti-slip footwear to brave the monsoon starting at INR 150. These are mostly tiny stalls that don’t have a name. So follow the landmarks and you’ll find them. Also, don’t forget to carry your bargaining skills here. It will come in handy, take it from us.